San Diego Comic-Con hasn’t gotten underway yet, but Mattel may have already won the show. Following the Spock 1964 Buick Riviera exclusive that will be available once Comic-Con starts, today Hot Wheels revealed a new Death Star trench run set featuring fantastic four-wheeled versions of TIE Fighters bearing down on an X-Wing. 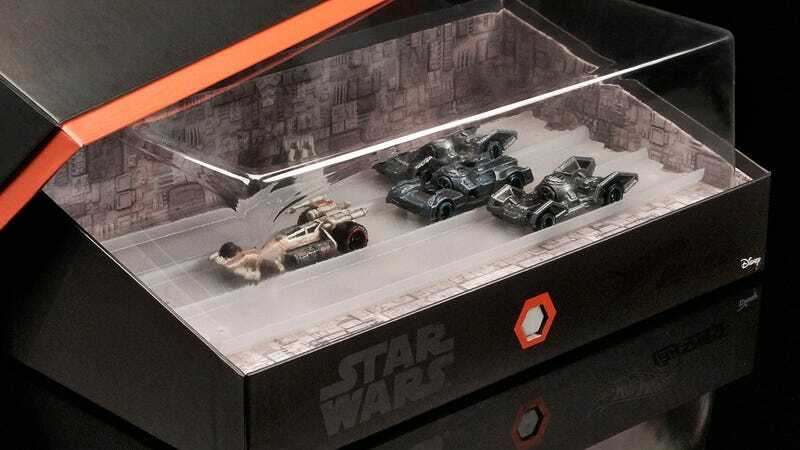 The four Hot Wheels cars included with the set look like a fantastic mashup of Mad Max and Star Wars, and the packaging even features lights and sound effects, plus three short sections of Hot Wheels track to expand your ever-growing racetrack. The set will exclusively be available at the Mattel booth if you’re lucky enough to be heading to Comic-Con this year, but you can also pre-order one from MattyCollector for $50 if you can’t make it to San Diego.